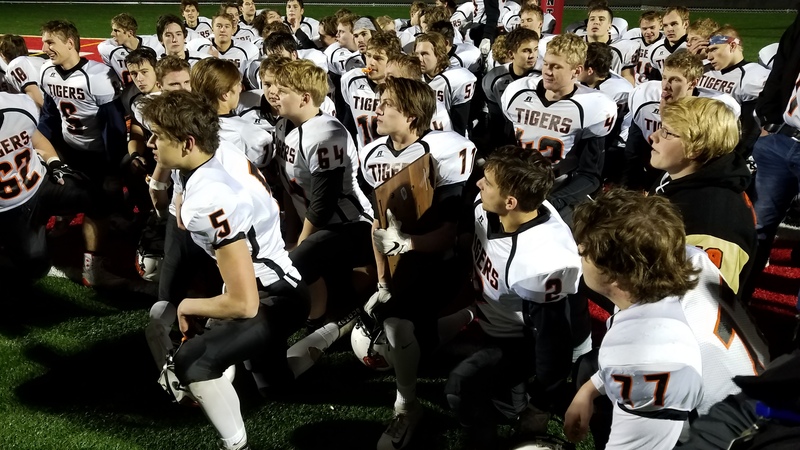 A smothering defensive effort and a big-play second half made for a Section 6-4a championship for the Delano football team. Sam Kern’s three second-half touchdowns were the difference in the Tigers’ 20-6 win over Zimmerman Friday night at Monticello. In a game where catching the football was problematic at times for Delano receivers, Kern made an impressive adjustment on the football, snagged it with one hand, kept his balance, and finished the play for a 64-yard touchdown on the opening drive of the second half. The extra point tied the game 7-7. Kern wasn’t finished making big plays in the third quarter. On the sixth play of Delano’s next drive, Kern busted through the line, sprinted through the open field, pulled a Thunder defender, and rolled over another into the end zone for a 38-yard touchdown run. The kick gave Delano a 14-7 lead. Kern’s third touchdown didn’t come in the third quarter, but on the first play of the fourth. It was a two-yard. Delano’s defense kept Zimmerman’s offense frustrated all night. At the start of the game, the Tigers bent not did not break, as the Thunder drove 67 yards on 13 plays to the Delano 4-yard line. That’s where the drive stopped when Delano made a goal line stand. Zimmerman’s touchdown came early in the second quarter on a drive that started on a short field after Delano failed to convert a fake punt late in the first quarter. The Tigers were all over the Thunder offense the rest of the way. Delano recorded six quarterback sacks and recovered two Zimmerman fumbles. Next up for Delano is the state tournament. The Tigers (7-3) play Section 5 champion SMB, which is 10-0, Friday night at St. Cloud State. Kickoff is at 7 pm. SMB defeated Benilde-St. Margaret’s 16-14 in the section finals.